Figure C.1: Solutions of eq. (C.6) are plotted for indices of or (the most extended one), or (the middle), and or (the most compact one). For gas extends infinitely and the solution has no zero-point. at . 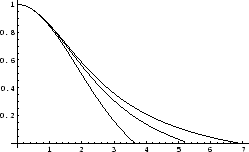 Solution of this equation is plotted for several in Figure C.1.